After a decade of success the Harry Potter series has come to a conclusion. It all began as a children's story under Chris Columbus's direction in 2001. The first movie, Harry Potter and the Sorcerer's Stone was a box office success but was largely overshadowed by the first chapter of The Lord of the Rings trilogy amongst the older audience. The third movie, Harry Potter and the Prisoner of Azkaban, directed by Alfonso Cuaron, is still probably the best in the series. It was a drastic change in look and feel: darker and tighter, setting the tone for more mature future development. The next installment, under Mike Newell's direction, acknowledged both this fact and the supposed growing older of the fanbase by moving the series into PG-13 ground. When David Yates, a relatively unknown TV director, was selected to continue the saga many were puzzled and doubtful. But (un)surprisingly, Yates went on directing all four final episodes. While the material he was working with was not always interesting he managed to bring in some fresh air. Yates succeeded in fleshing out Harry's inner turmoil, which was largely uninteresting up to then. At times his episodes got an almost indie drama touch to them, especially when putting the three main characters against the urban London backdrops. This weird (for a multi-million budget blockbuster) indie inclination culminated in the character drama aspirations of Harry Potter and the Deathly Hallows, Part 1. Boring happenings storywise aside, this movie could easily be mistaken for a character driven drama, masterfully filmed by Eduardo Serra. 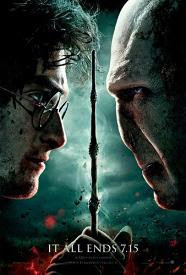 The closing installment in the series, Harry Potter and the Deathly Hallows, Part 2, is all about the final confrontation of Harry and Voldemort, the event that the whole series was building towards. It is competently executed fast paced non-stop action with tight script and editing, and in stark contrast with the slow previous episode. Everything is at its best here: the acting of the leads is passable (as opposed to "unbearable" before), the visuals are convincing, the musical score of Alexandre Desplat is the best in the series (and yes, this means better than John Williams's scores for the first three episodes). Unnecessary exposition and overexplanations are shoved aside and the only infodump sequence is beautifully made. The cinematography is great. Eduardo Serra had to fill in the shoes of Bruno Dellbonel (who got an Oscar nomination for filming the sixth episode) and he did exactly that, and then some more: framing is perfect, the camera movement and angles are vigorous, but competent, and the lighting is gorgeous; it conjures some suitably dark atmosphere without the images themselves being unpleasantly dark and making stuff hard to see. And unlike the so-so leads, the seasoned British actors in the supporting roles are all delightfully good. It is not all flowers and songs, though. Despite a couple of thrilling sequences, battle scenes are not very epic (compared to a certain fantasy trilogy) and may feel small. This is not a fault per se, but is worth noting. There are a few cringeworthy attempts at pathos delivered through pathetic speeches, pun intended. The epilogue closes the cycle and returns the mood back to the first movies which is not entirely convincing. A more contemplative final might have been a better choice cinematically, but apparently fans of the books need to be serviced too. This final episode is also the first and only of the series with a 3D release. The movie is post-converted to 3D which is usually a bad sign (cashing in on the 3D wave and whatnot). But in this case it is well done and makes the whole 3D experience less taxing. Still, watching this in 3D is not a must so feel free to see it in good old 2D. In conclusion, this is a very easy movie to recommend (or not): if you haven't seen the previous episodes, there is no reason to go see this one as it is really the last chapter in a series; if you've seen them, you obviously don't need our recommendation to watch this one. The series has certainly been an uneven ride but it is nonetheless an unprecedented undertaking in cinema (and a pop culture phenomenon), and that makes it worth knowing. For other movie reviews explore our Review Maze.